Started geometry with a great discussion about the finding the sum of a long list of consecutive numbers. Several students came up with shortcuts that were valid and we eventually made our way to Gauss. I was very impressed by the reasoning skills of many of the kids. I have two or three that constantly look at me with disdain and I tried to bring them into the conversation but they were not interested. I'm going to have to pull them aside at some point and have a discussion about body language and attitude. After that, we had a 20 question test on concepts from Algebra. I got to use my new GradeCam software and the item analysis reports are AMAZING! I showed the class which items we were going to fly through, which ones we should discuss and which we need to spend a good amount of time working with. They were genuinely interested in the data which made me giddy. Afterwards, they got their textbooks and began front-loading vocabulary for the chapter. I asked to the take some time this weekend looking at the questions they got wrong to determine if the problems were conceptual, or just carelessness. Both will give valuable information and determine how we move forward. I also gave a 10 question quiz in Math 8 on the concepts that we covered for the last few days. The results were abysmal, but I maintained enthusiasm and emphasized that it was just a pretest to see where we were. Their grades will not be affected by the score, but how hard they tried. All of them tried very hard, so I was pleased. There is a ton of work to do with these kids, but if they maintain the level of work ethic and energy that they've had so far, I think it will be good! I also told them to try to figure out where they went wrong with each problem. After class, a girl came up to me and asked me to call her grandmother to tell her what a good job the student is doing. She said her grandmother didn't believe that she was being nice and doing well. While the thought made me sad, I was very happy that I was able to say that yes, I would call. The girl is a bit below grade level, but she tries hard and is very nice. For those kids, I will do anything. The last class itself went well. I have good participation from most of the kids. I say most because I have two who seem completely baffled as to why I don't want them sleeping in class. Baffled to the point where I had to take their chairs away to keep them from putting their heads down. It ended in a confrontation where the old me came out. I wasn't pleased. I'm clearly going to have a talk with them once my temper has cooled off. I also plan to call home this weekend and have a chat with the parents. I am exhausted. My allergies are flaring up, I ran this week several times, although not as much as I should have, and I have ACTUALLY been doing work! I've been getting to school 90 minutes before the students get here and I still just barely get everything done on time. If you ask my own teachers, or my parents, they will tell you that I spent more time and energy in school avoiding doing work than it would take to just do it. Much of my professional career has been the same way. I've always done exactly as much work as I felt I needed to and not a single bit more. I still feel the same, so I guess that means I think I need to do more work. Next week will be another 4 day week, so hopefully I won't waste the long weekend. I have a ton of things that I should do, like finding projects and activities for my classes. Lots of time to fill and I don't want to waste it on worksheets. Interestingly, the students in Math 8 would rather do hundreds of mindless problems than an activity that makes them think. Goal for this year: Reverse that! Today was a good day! I still feel woefully under-prepared for my classes, but it's getting better. I find myself scrambling around to get ready when before I was perfectly fine to wing it. I'm remembering how to fill 90 minutes without wasting it. It has been a while. My geometry class is filled with some really great kids who are bright and eager to learn. Those who aren't as eager are being dragged along by the rest of the class. The very BIG class in a very SMALL space. This is the group whose parents will be showing up to back to school night and wondering why they can't fit in my class. That night should be interesting, but it's a month off, so I'm not going to worry about it. I have to say that, so far, I like this group of kids MUCH more than I liked the kids last year. They seem nicer to each other and to adults and much more receptive to education. They are more free with smiles and so, in turn, am I. Last year, the percentage of students that I actually liked was very small. It made me feel awful about coming to work and being a teacher at all. I know that we will never like ALL of our students and that isn't necessarily part of our job requirements, but it certainly makes the job more enjoyable. I also want to clarify that just because I don't like a student, it doesn't mean that I don't see their value as a person. I just don't want to hang out with them. This year, however, I really like a large portion of my students. It's a very weird feeling for me. It has been a long time since I've been able to look down the hall and not feel utter disappointment at the wasted potential that I see there. Now, I'm starting to feel pride in the accomplishments of students, some are mine, some I don't even know. It feels wonderful. I know how dark and cynical the previous paragraph is. Perhaps that will shed some light on why, before this year, I was planning to leave teaching altogether. In any event, to the classes!! For the second question, one student actually came up with 1/2 n(n-1)! Holy crapamole! (That is a terrible taco topping, by the way. My favorite part of today was that during the Bell-Ringer for geometry, I discovered that how I had been thinking about question 3 was completely wrong! In the middle of the discussion, I had to readjust my thinking because of an off hand comment that one student made to another. It was a great moment! According the geometry agenda from the high school teachers, I was supposed to be reviewing algebra equations. I didn't want to just give them a sheet and ask them to solve, so we played Function Detectives! Detective Twilight Sparkle uses deduction! In this game, I have functions under the black squares. Students in the class will say a number and I will tell them what the output is. They then need to figure out the function. They LOVED it! I was expecting that it would take 4-6 guesses until they got the function, but in both cases here, they got it in two, the minimum possible for linear functions! I asked if they wanted a harder one and they said...YES! So I picked a quadratic, which they got in 3-4 guesses. These kids are amazing. It wasn't just one or two kids either. I made sure to move around and ask quiet students for their input. I used the game as a modeling exercise, broke the students into groups of four and had pairs made up a function to quiz each other, while I circulated and helped stuck groups with strategy. It was a fantastic success. There was only one group that needed constant attention and it was because two quiet people ended up with two chatty people. In the Math 8 classes, we worked on properties of integers. I gave them examples and we had a discussion (not just lecture) about the properties and what they mean. I got to use my Oprah analogy when talking about distribution, which is one of my favorites. Me: "When Oprah decides she's going to give out an iPhone, does she give it to just one person?" S: "No. She gives it to everyone." Me: "Right! 'YOU get a new iPhone and YOU get a new iPhone! EVERY BODY GETS A NEW iPhone!' Now lets look back at the problem 3(x+2). In this problem, the 3 is Oprah and the (x+2) is the studio audience. You have to make sure that you're fair and give that three to everyone in the audience!" It really resonates with the kids and it helps when the question of (x+2)*3 comes up. Me: "If Oprah is on stage and gives out iPhones, who gets them?" Me: "Good! Now, if Oprah is the back of the audience and gives out iPhones, who get them?" Me: "So, does it matter if the 3 is in front or behind the parentheses?" Me: "Why not? What property tells us that?" S: "Commutative property of multiplication." Me: "AWESOME!! You guys RAWK!" This was an actual conversation. Beth knows how many miles she ran this week. She also knows how many hours she ran. How can she figure out her speed in miles per hour? They had tremendous difficulty figuring out what was being asked. I asked them why and they said there were no numbers. What would you do if there were numbers? I guess I would divide the hours by the miles. To find 'miles per hour?' Yeah! We tried putting numbers in, arbitrary ones, and they got it almost immediately, but on the next one, they weren't able to figure it out and didn't think to put numbers in there to try like we did with the previous one. It was frustrating and confusing. Clearly, I need to work on helping them make connections. The best non-student part of my day was the after-school faculty meeting. These are normally very dry and procedural, or run by yoga masters who want us to employ yoga in our classrooms. This one, however, was AMAZING! The fact that I presented was totally unrelated to my enthusiasm for the meeting. I'm lying. It's all about me. I gave a Storify presentation about 4 apps and utilities that I will be using in my class this year, including Storify itself! (Very meta, I know!) It started of a little slow, but I was able to walk around the room, gathering attention the way I do in class. I prepared 6 scantron tests for random teachers to demonstrate GradeCam. They were suitably impressed by the analytic reports generated. I linked to my school web page to show that I could embed the feed from Remind101 for when I text my homework assignments to my students. I gave participation points to faculty members, publicly rewarding them through Class Dojo, while chastising those who weren't paying attention. The presentation was very well received and I had several people come up or text me afterwards wanting to know more. I told them that I would be happy to help them set up any of the programs and help in any other way that I could. I left work feeling tired and happy. I could get used to this. Throughout my career in education, I have run across various teachers that make me think "Holy crap! I want to be like that!" I look at what they do and I try horribly to emulate them. This almost never works for a variety of reasons. The main ones that come to mind are that I am too lazy to prepare the lessons as well as they do and that our personalities are different. They are usually pretty nice and I am ... not. I would like my students to do more self-directed learning, but with much of my population, that's very difficult and I'm not sure how to move them in that direction. I think that with the Geometry class this year, that will happen. Class today was incredible. I'm following the curriculum that has been laid out in the high school. It's fairly scripted, which is good since I haven't taught geometry since 2005 and the teachers who wrote it have been doing it for years. They work very closely with the state mandated tests and know what skills are being tested. They are also excellent teachers. I, however, have double periods, so I can go more in depth and do more "fun" things. I began class with the honeycomb warm-up that deals with pattern recognition and generalization. It's the same warm-up that I use for my Math 8 class, but with slightly modified questions and a different follow-up discussion. Several people have said it was way too wordy. I think I agree. To answer the third question, I had a student come to the board and drag hexagons around the Promethean Board to show his solution. After the warm-up, we did the vocabulary activity that is done at the high school. Students were given a MASSIVE list of Algebra 1 vocab that they should know, put into groups and asked to define 10 terms in their own words, pick another 10 and write examples or pictures, then pick 5 more that they don't know. Many of these students are self-directed learners and they worked VERY well in their groups, producing good stuff that I can put on my walls! After that, I did the Marshmallow Challenge with them. Several of the groups jumped right in, trying various designs, having quiet, intense discussions and working VERY well. I only had two groups that tried one design and gave up when it didn't work. Me: "What are you guys doing right now? Where's your tower?" Them: "We made one and it was good, but then it fell over." Me: "That's great! It's part of the process! Find something in your design that worked and improve it, find the thing that didn't work and fix it. Failure is acceptable. Giving up is not." The Marshmallow Challenge is difficult for me because I have trouble refraining from giving suggestions. How I plan my lessons: The more I talk, the less kids learn. Full disclosure: She's one of the teachers I want to emulate. Math 8 also started VERY well. The kids came in and, those with notebooks, began working on the warm-ups immediately. I can tell who the chatty kids are going to be and I'll be dealing with it ASAP. After a lengthy discussion about pattern recognition and generalization of patterns, I assigned them two problem solving tasks that I stole from the beautiful and brilliant Fawn Nguyen. I had them work in small groups, doing the work on scratch paper and then transfer the finished product, including their process to a larger sheet of paper to be hung up in the room. They were then given a list of vocabulary for the chapter to define. I usually don't like this type of activity, but I've also found that these are the kinds of activities that my students will do without complaint. I have no idea why, but they are more willing to do the tasks that require the least amount of creativity (read: most boring). Perhaps they were trained this way. Part of my job will be to break them of that and get them excited about the interactive and hands-on activities. My last period did not go as well. Two of the four groups needed constant redirection back to task and were constantly asking me for the answers. When I refused to give them and instead asked directed questions, they gave up. This is more like what I have experienced in the school so far. "You mean we have to draw rectangles? How many?? More than 2?!? That's too much." After the success of the previous classes, this is very frustrating. I need three of me in the room to make sure I'm hovering over groups at all times. After explaining what I wanted four times, one group still claimed that they had no idea. Perhaps if they were interested in listening. I think a better teacher would be able to figure out how to bring them around and I will continue working on it. By the time this period rolls around, I'm tired and I'm hot. I know that I'm not serving them as best as I can and I hate that. I need to find a better way and I can't let my frustration at the end of the day overshadow the joy I feel at the beginning. New Goal: Figure out how to attach things to the painted brick walls in 80% humidity. Finally met my students! My 8th grade geometry has 30 students in a room that can physically support 28. I don't actually mind, but I'll need to get a fan. In my pre-algebra classes, I did the standard spiel, put the fear of God in them and explained that the class will be exactly as fun as they allow me to make it. I have prior relationships (mostly disciplinary) with several students in there so it was nice that they got to see a different side of me. I am excited for that class. 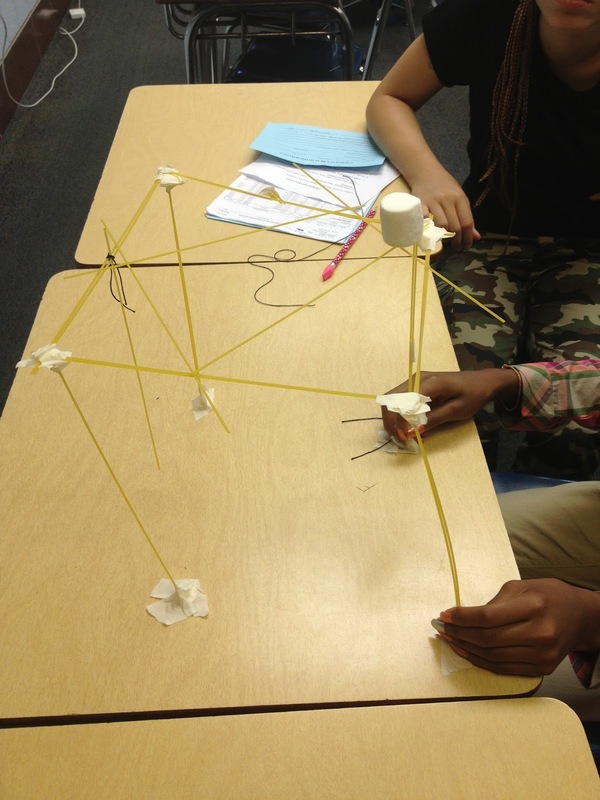 After the clerical stuff, I had them do the Marshmallow Challenge. Two of the groups worked quietly and came up with interesting designs, which didn't stand. 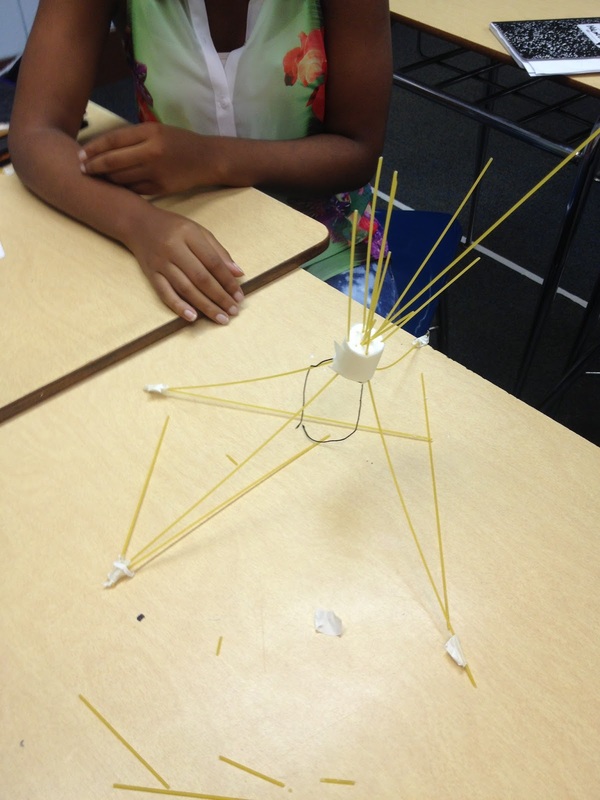 The others worked loudly and came up with a spaghetti spear that didn't stand. I liked how the groups worked to get the towers to stand, but I was disappointed by the lack of creativity. In my last class, I have a student who was a trouble kid last year. In the morning assembly, SHE was the one who was pulled out for being rude to the presenter. I pulled her aside in her lunch to tell her that I had heard how bright she was and I know we had some run ins last year, but that I'm excited to have her in my class and I'm looking forward to a great new year. She looked shocked and she smiled. The last class had a similar issue as the previous. Two of the four groups displayed amazing effort and ingenuity while the other two tried two things and gave up, stabbing the marshmallow over and over, leaving a disgusting mushy mess covered in string and perforated with pasta. Two girls who started the class with attitude and had their heads down ended up working very well with their groups. I think I'll do this again at the end of the year and compare the thought processes. Day 2 down, 178 to go to make a positive impact. I think this will be a good year. I have optimism about my job for the first time in a long time. On a similar note, my principal was so impressed with my impromptu presentation of all the things I did at and after Twitter Math Camp, that she asked me to present some of the apps at the faculty meeting on Thursday. I'll be avoiding math-only apps like Mathalicious and Desmos because I love them so much and I don't want to lose the history teachers. I've started building a Storify presentation which is super meta because it will include Storify as a resource! P.S. : Don't tell anyone I let the kids eat the extra marshmallows. It's a violation of our wellness policy.